Everyone involved in healthcare makes high-stakes decisions. One key to effective decision-making is knowing when to trust your intuition and "go with your gut," and when to take a step back and think twice before choosing a course of action. In this talk, Chabris, creator of the famous "invisible gorilla" psychology experiment, shows how our decisions are often clouded by our intuitive ideas about how the mind works. With entertaining examples and surprising scientific studies, Chabris will leave audience members with a deeper appreciation of how we all really think, and how to make better decisions in their own lives. Ben Dattner is an executive coach and organizational development consultant. He has helped a wide variety of corporate and non-profit leaders, teams, departments and organizations become more successful by developing and utilizing a better understanding of the impact of individual psychology and group dynamics on all aspects of their performance. His executive coaching and consulting services enable organizations to achieve higher returns on their human capital investments by making better hiring and staffing decisions, enhancing the professional capabilities of executives, managers and employees, configuring teams more effectively, and improving communication and collaboration. Ben received a BA in Psychology from Harvard College, and his MA and Ph.D. in Organizational Psychology from New York University, where he was a MacCracken Fellow. His doctoral dissertation analyzed the relationship between narcissism and fairness in the workplace, and his masters thesis examined the impact of trust on negotiation. Before graduate school, Ben worked at Republic National Bank of New York for three years, first as a Management Trainee and then as Assistant to the CEO. After graduate school, Ben was Director of Human Resources at Blink.com before founding Dattner Consulting. Ben is an Adjunct Professor at New York University where he teaches Organizational Development in the Industrial and Organizational Psychology MA Program in the Graduate School of Arts and Sciences, and has taught Strategic Career Management in the Executive MBA Program at Stern Business School. Ben is also an Adjunct Coach at the Center for Creative Leadership and part of the Hogan Coaching Network with advanced accreditation by Hogan Assessment Systems. Ben is a member of the Society of Industrial and Organizational Psychology, The Society of Consulting Psychology, and the Metro New York Applied Psychology Association. A frequent contributor to Harvard Business Review, Ben is frequently quoted in the press, including The New York Times, The Wall Street Journal, Fortune, Business Week, Inc Magazine, Crain’s New York Business, The Chicago Tribune, The Baltimore Sun, The Washington Post, USA Today, The Christian Science Monitor, HR Magazine, and The Globe and Mail. Ben has also been interviewed on CNBC and CNN and has served as the Workplace Consultant on Morning Edition on National Public Radio. 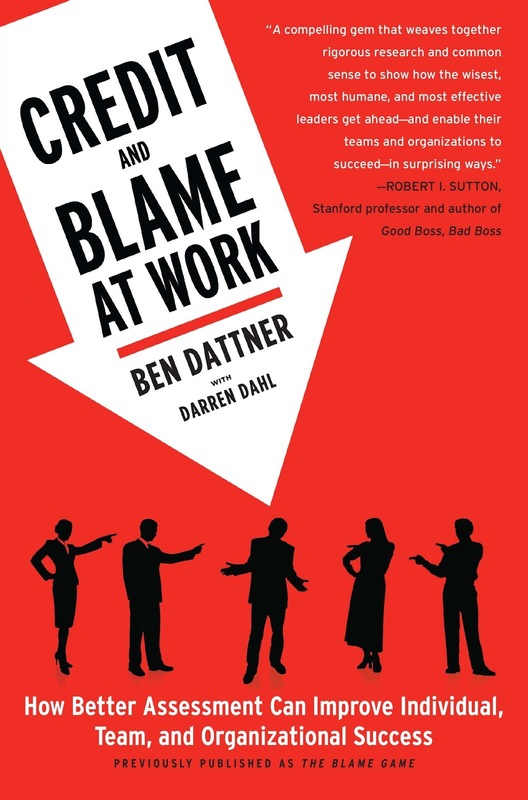 Ben is the author of Credit and Blame at Work: How better assessment can improve individual, team and organizational performance, published by Simon & Schuster.